NJ BIKESCHOOL is a comprehensive, on-bike, on-road bicycle safety program targeted to New Jersey’s youth in grades 4-6. NJ BIKESCHOOL transports all the materials needed including the bikes in a truck and takes them on site to schools, summer camps or recreation centers. 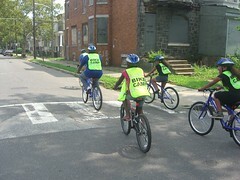 The program includes two hours of safety instruction and two hours of on-bike riding instruction. The course is part of NJDOT’s Safe Routes to School program and is taught by certified instructors from the League of American Bicyclists. 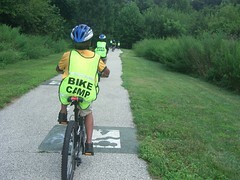 In August New Jersey NJ BIKESCHOOL has moved into Camden with 4 hour bicycle education sessions at all of Camden's Summer Recreation Camps with the final session at the Sumner School on August 12. All Camden City students participating in the Summer Recreation program are eligible to participate at no charge. "The program has run smoothly and we love working with the kids. The Camden kids seem especially appreciative." Says Program Coordinator Leigh Ann Von Hagen. "When they took a lunch break yesterday they all made sure that they were going to come back for more in the afternoon. We also taught a handful of kids how to ride a bike." NJ BIKESCHOOL is currently a pilot program and there are high hopes for expansion next year.